The massacre of 12 people by gunmen on Sunday at St. Phillip’s Catholic Church, Ozubulu in Ekwusigo Local Government Area of Anambra State was the climax of a drug-related gang war that started four years ago, as learnt on Monday. According to an Uzubulu source, more than 30 sons of the community have died in South Africa as a result of the raging war. Professor Linus Amobi Ilika, former Commissioner of Health in Anambra State and pro-life activist, confirmed that there had been frequent killings of indigenes of Ozubulu community living in South Africa and their corpses conveyed home for burial before the shooting of worshippers at St. Phillip’s Catholic Church, which he described as an abomination against the land. 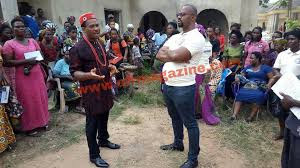 However, Ilika said there is no evidence that High Chief Aloysius Nnamdi Ikegwuonwu, who built the church where the lone gunman shot worshippers, was involved in the drugs trade, describing him as a philanthropist. “But for whatever it is there is no single justification for assassinations and invasion of a place of worship and committing of such mass killing of innocent worshipers in a place of worship”. He appealed to people to join in prayers of atonement and reparation to God for the heinous sin and sacrilege. According to a source, Ozubulu drug barons control about 60 percent of wholesale drug sales in South Africa (not importation or retail). The source alleged that Ikegwuonwu, also known as Bishop, is at the centre of the crisis and controlled a cartel in SANS, Hillbrow/Berea, Johannesburg. He said a long time ago, Bishop allegedly invited his high school classmate and friend to manage his cartel, even though he also brought a lot of Ozubulu boys from Nigeria to help him secure SANS. Six years later, the source said, Ikegwonwu’s manager (the former classmate) told him he was resigning to start his own business. “Ikegwuonwu then asked him to leave SANS and go somewhere else to start his own trade. The manager (I have forgotten his name now) refused to leave SANS. Some people alleged Ikegwuonwu paid him money to leave SANS but he refused”, he noted. The source said nobody heard about the manager thereafter. “Ikegweonwu asked all drug barons to leave SANS for him alone. Some left while some stayed back, and that was when the fight started. “2016 was the worst year for Ozubulu people in South Africa. Over 30 drug barons were killed”, he noted. The source said the church shooting was targetted at Ikegwuonwu’s father just to hurt him and force him out of hiding. He recalled that when Ikegwonwu’s father was kidnapped, N60 million was demanded but he paid N120 million and warned them not to harm his father. It would be recalled that gunmen on Sunday killed 12 worshippers and injured 25 others in an early morning attack on St. Phillip’s Catholic Church, Ozubulu, Ekwusigo Local Government Area of Anambra State. An eyewitness said unidentified gunmen arrived the church in a Lexus Sports Utility Vehicle (SUV) during the 6.30a.m mass when the congregants were engrossed listening to the sermon. According to him, three gunmen disembarked from the SUV and stationed themselves at the three main doors leading to the church auditorium as one of them immediately entered the church and opened fire on the worshippers at close range. He said before the shooting started, the attackers had disconnected the generator supplying electricity to the church to have absolute darkness and make it impossible for victims to identify them. Eight adults and four children died in the attack. Rev. Fr. Jude Onwuaso, Parish Priest of the Church, told Governor Willie Obiano and the Anambra Commissioner of Police, Garba Umar, who visited the church on getting a report of the incidence, that the gunmen stormed the church and began shooting indiscriminately killing at least 11 on the spot. Meanwhile, Garba Umar, Commissioner of Police in Anambra, has said that some suspects have been arrested in connection with Sunday’s killings at St. Philips Catholic Church, Ozubulu. Umar revealed on Monday that the number of arrests would not be disclosed so as not to jeopardise ongoing investigation into the massacre of 12 persons by unknown gunmen. The commissioner had on Sunday said that the attack was an isolated case of a feud between two individuals from the same community, adding that the police had contacted some persons who would be useful in the investigation.